Our Official Training Videos have been responsible for teaching literally millions of people to use SketchUp. 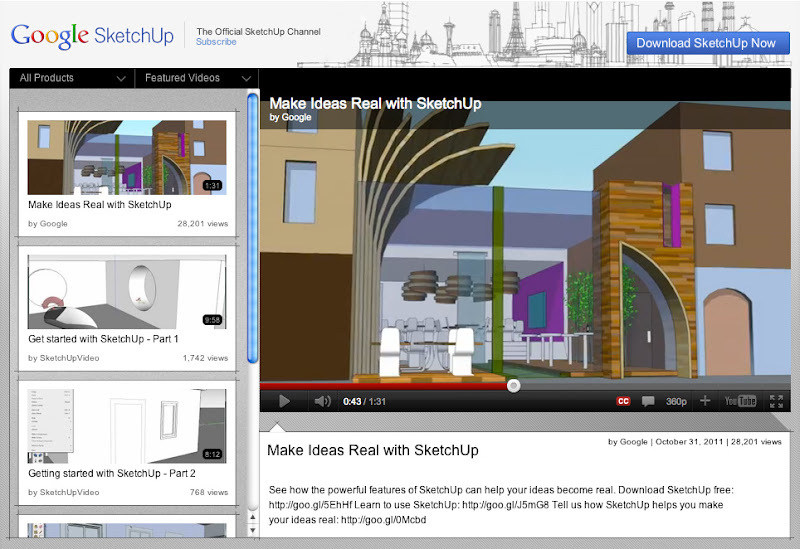 Concepts of SketchUp, the first video in the old series, has been viewed over 7 million times. Collectively, people have spent something like 40 years watching that video. That’s a lot of popcorn. One more thing: We didn’t stop at the videos. We gave the whole SketchUpVideo YouTube Channel a facelift. With helpful navigation menus in the upper-left corner, a new masthead and a big, blue Download button right at the top, SketchUp’s home on the world’s biggest video sharing site is now a whole lot lovelier. Pop on over when you get a chance. These videos got me hooked in the beginning. And maybe it's time I say thank you. I'll have to take a look at the updates. But I use the version 8 I did not find this option in this list where he is? is a jewel. His videos in support of his book "SketchUp for Dummies" are already very helpful. Google made the right choice with this guy. What did they change on the page that breaks it now? Does it not get along with stop autoplay?